Put all the vinaigrette ingredients in a glass jar with a tight-fitting lid and shake vigorously to combine. In a mixing bowl, combine the mayonnaise, mustard, ½ tsp salt and ¼ tsp black pepper. Add the chicken and toss to coat. Grill until a digital meat thermometer reads 170F (about 6 minutes per side). Cool and cut into bite sized pieces. Trim and wash lettuce leaves; dry then tear into bite size pieces. Combine the lettuce, parsley, and mint in a large mixing bowl. Toss with just enough vinaigrette to coat lightly, about 4-5 Tbsp. Season with a little salt and pepper and toss again. Turn out onto a platter. Peel, pit and dice the avocados; toss in a large bowl with 2 Tbsp of vinaigrette. 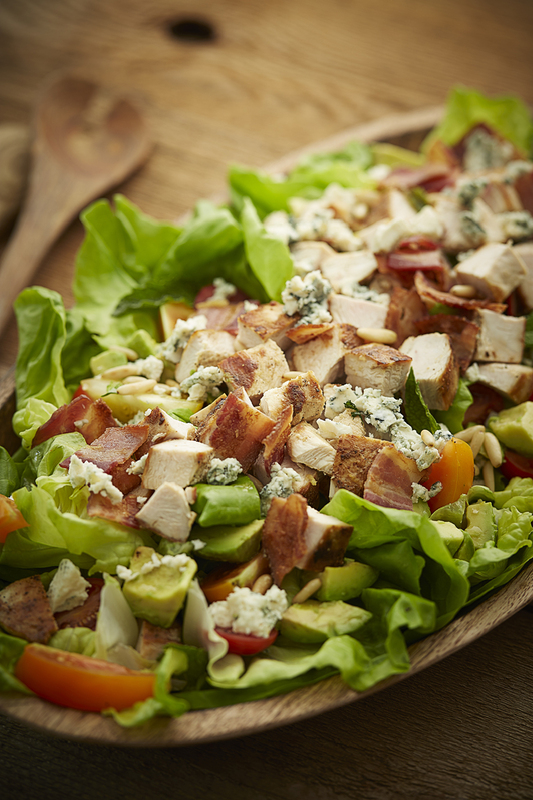 Add the tomatoes, Roquefort, pine nuts, and the chicken, and toss lightly with another tablespoon of the vinaigrette. Top the lettuce mixture with the chicken mixture, sprinkle with bacon and chives. Serve immediately. Keep extra vinaigrette in the fridge for up to 1 week – bring to room temperature and shake well before using.